Create an ornamental effect in your landscape with a specimen plant. Chamaecyparis Reis Dwarf. Jim Graeler, Chesterfield Valley Nursery. Karl Fuchs, Deodar Cedar. Daniel Mee, Frisella Nursery. Japanese Seven Son Flower. Eric Ringhofer, Green Guys. Photography courtesy of Missouri Botanical Garden PlantFinder Glen Kopp. 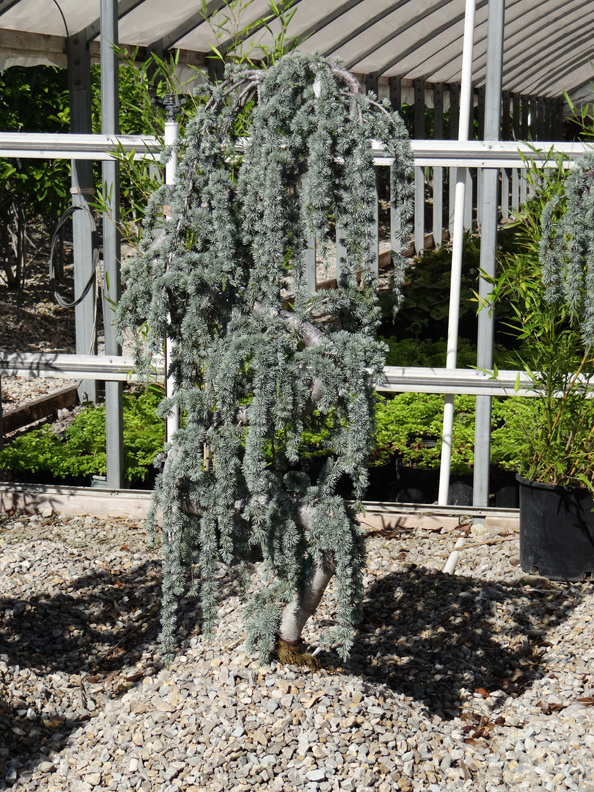 Weeping Blue Atlas Cedar. Jim Meiners, Prestige Landscape. Black Lace Elderberry, Sambucus. Ann Lapides, Sugar Creek Gardens. Clematis Sweet Summer Love. Ann Lapides, Sugar Creek Gardens. Create an ornamental effect in your landscape with a specimen plant. Serving as the focal point in a particular spot, specimens bring dramatic impact. “Unique and a bit unusual is a good way to describe the Chamaecyparis Reis Dwarf, one of my favorites. This conifer has foliage that is a dark, rich green with short contorted branching. “ Jim Graeler, Chesterfield Valley Nursery. 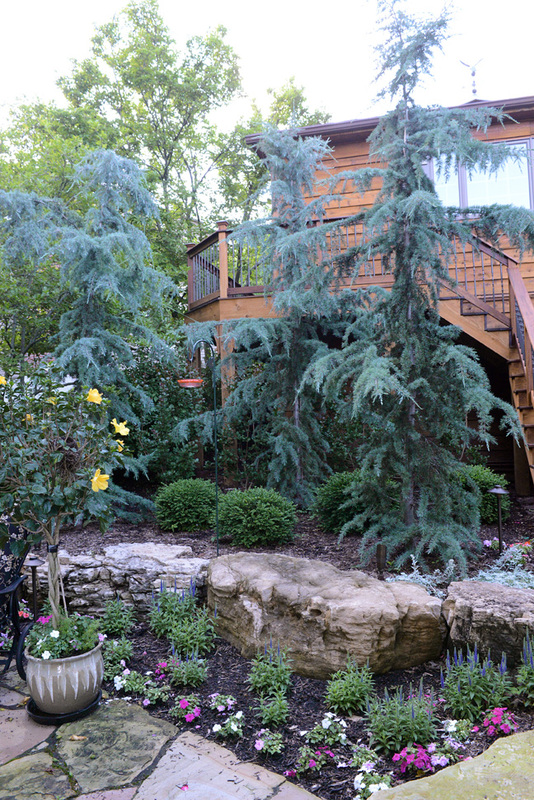 “Karl Fuchs is a specific variety of Deodar Cedar that has some of the bluest new foliage you’ll find in the St. Louis area. The upright, pyramidal habit is quite symmetrical with a layered branching structure as it matures. 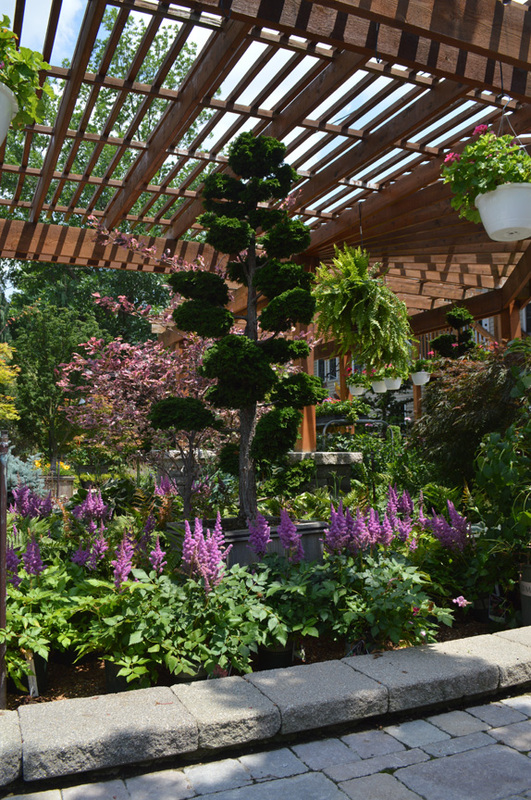 It can eventually reach approximately 40’ in height by a 15’ spread and could definitely be a focal point in many gardens.” Daniel Mee, Frisella Nursery. “Weeping Blue Atlas Cedar is a colorful low-maintenance plant that is a nice contrast to grasses, perennials and sheared evergreens. They are also available in long pendulous specimens that look spectacular weeping over a boulder wall or waterfall. We have created archways over walks with this plant that create a beautiful arbor or entrance to a garden.” Jim Meiners, Prestige Landscape. 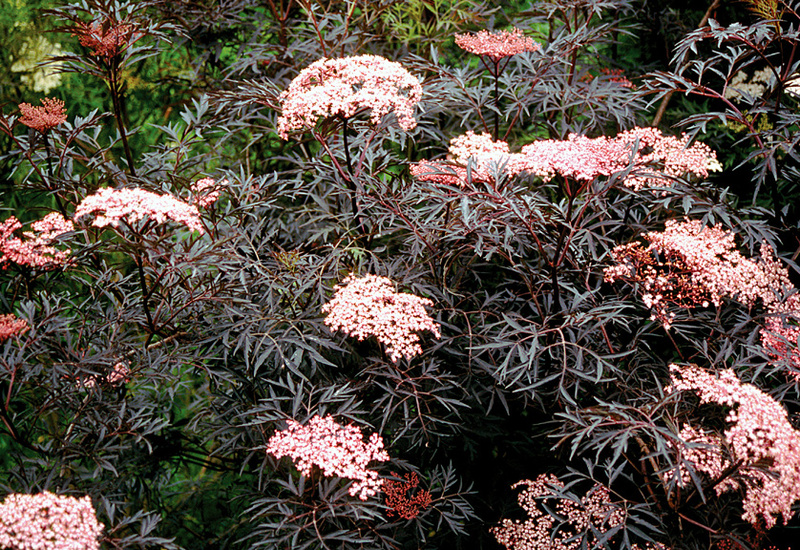 “The ‘Black Lace’ Elderberry, Sambucus has breathtaking deep cut, jet black leaves that present themselves like graceful fans. Bright pink flowers, resembling mini umbrellas, adorn shrubs in June, and blackberries that birds adore follow. It makes a stunning specimen, adding drama, fascinating shape, texture and color.” Ann Lapides, Sugar Creek Gardens. “Perfume your whole yard with over 1,000 scrumptious cherry-vanilla fragrant blossoms from the Clematis Sweet Summer Love. 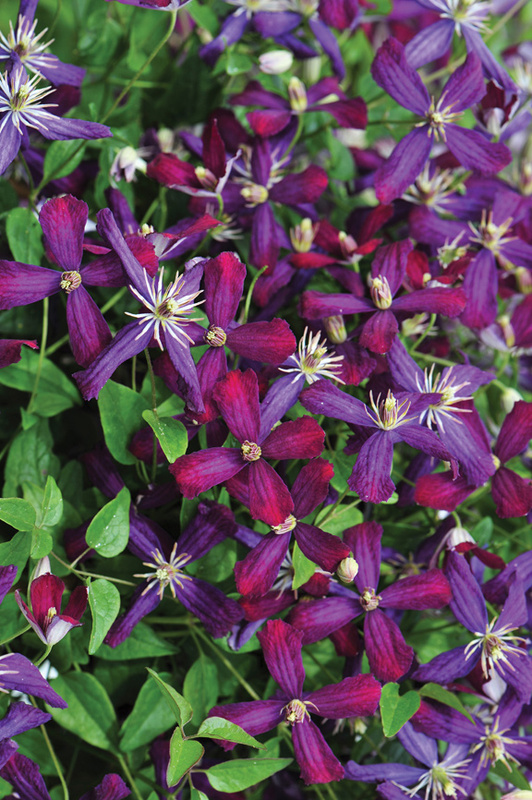 Similar to autumn blooming Clematis, the Summer Love blooms a month earlier, beginning in July, and blooms into October. Hoards of blossoms burst forth a deep red, mature to purple-red, then purplish violet to violet. All colors appear on the vine at the same time creating a brilliant display. It is easy to grow in sun or shade. 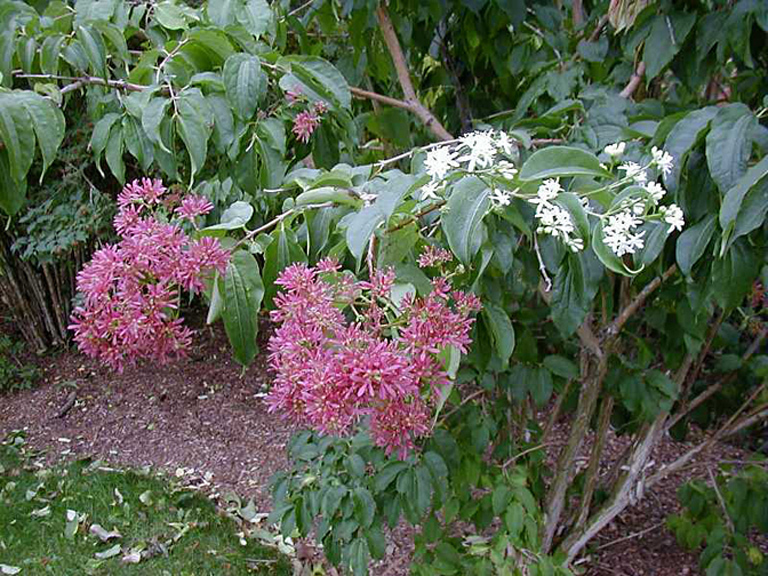 This specimen is perfect for a trellis in a most prized garden spot.” Ann Lapides, Sugar Creek Gardens.